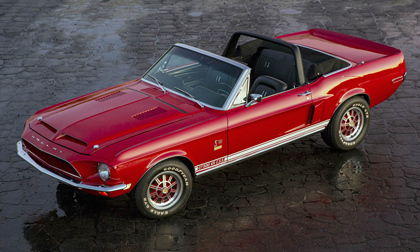 Las Vegas – January 12, 2018 – Executives with Shelby American, Inc., have announced that the company will offer a limited number of 50th Anniversary 1968 Shelby G.T.500KR “King of the Road” continuation muscle cars. The KRs will use 1960s era Mustang donor cars and include a Shelby serial number for documentation in the official Shelby registry. Powered by big block motors, the Shelby’s will be available in fastback and convertible body styles. The car will debut at the Scottsdale Barrett-Jackson Auction from Jan. 12-21, with an official introduction event on Jan. 20.